Hailing from Andorra, Nami are a relatively new band that apparently spent three years crafting their sound in the mountains of the Pyrenees, and damn am I glad they finally emerged. 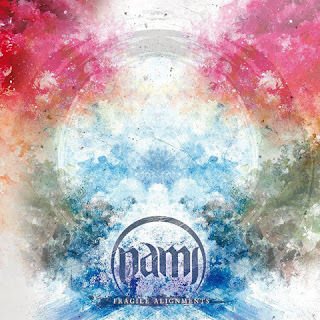 In general I am not a huge fan of Prog Metal, it’s a genre I like to visit every now and again, finding that sometimes there’s a band or an album out there that blows me away and that was certainly the case with Nami. The album Fragile Alignments took me by the horns and led me on a journey of epic proportions with beautiful melodies and brutal riffs that caress you like a lover then splatter your brain on the wall like a shotgun. Possibly my favourite thing about good Prog is when the music adequately reflects the emotion or message in the name of the song, such as when I first listened to “Awakening from Lethargy” and actually felt like coming out of hibernation after a long winter. I always love albums with a concept and this seems to goes through the elements of matter, anti-matter, earth, wind and fire, though I noticed a curious lack of water in there it didn’t make a difference when it came to the actual sounds that portrayed each of the songs. The production on this album is excellent, all the instruments are levelled perfectly and there doesn’t seem to be anything left behind in the mix. A rare occurrence for first releases but a welcome one that really makes Nami stand out amongst the crowd of new music entering the market in the last year or so. I think my favourite song on this album was “Cosmical Beginning – Air” as it begins like a swirling tempest and was easily one of the most evocative tracks on the album. Overall this album really shone for me, a great start for the band and hopefully a glimpse at more great music to come from them. I cannot wait to see these guys live and look forward to more Andorran Prog in the future!